Home › (GM) General Musings › MLB › Player Spotlight(s): What’s on Second? Ryan, Drew, Pirela, or Refsnyder? The New York Yankees traded away Martin Prado earlier this month, leaving Brian Cashman with a hole to fill at second base. It seems like the Yanks are left with only a few options: re-sign Stephen Drew (unlikely), start Brendan Ryan (definately possible), or give Jose Pirela and Rob Refsnyder a chance (where Cashman seems to be leaning). 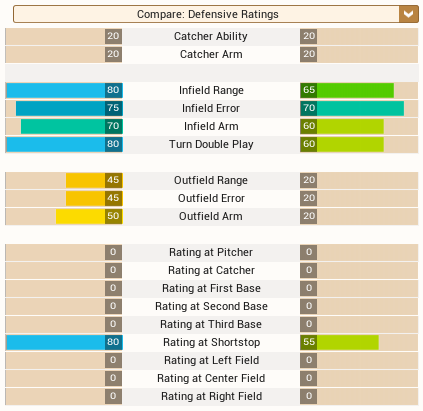 Let’s use OOTP15 to compare the two major leaguers and minor leaguers separately. Drew has only one extra year of MLB service on Ryan, but has had the opportunity to start. Ryan might have had that opportunity had it not been for Derek Jeter’s farewell tour last year, forcing Joe Girardi’s hand to start the legend more than he probably should have. 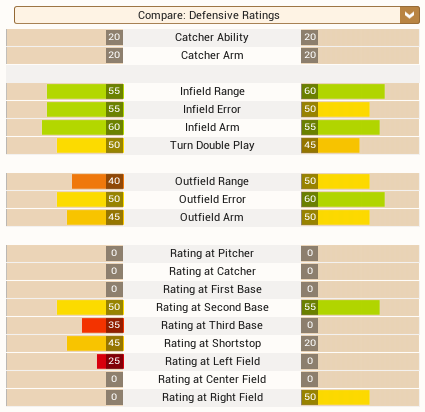 Based on the below hitting ratings, Drew is a superior offensive threat, with better contact, power and eye ratings. 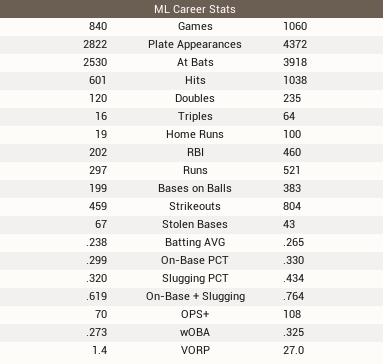 However, defensively is where Ryan shows his dominance, with an 80 shortstop rating (out of 80) vs. Drew’s 55. Because of his defensive skills at a premier position, Ryan’s overall rating is two points higher than Drew’s, although both have the same ceiling. But what about the minor leaguers? (Pirela on the left and Refsnyder on the right). 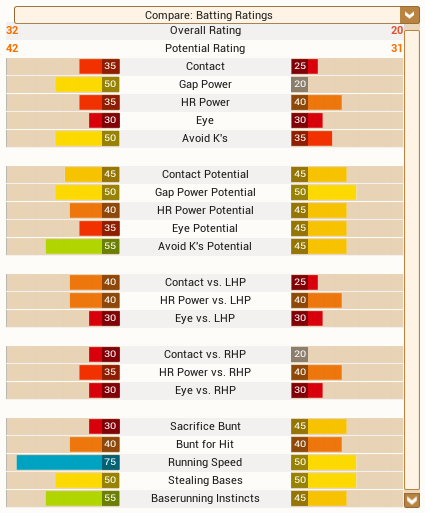 OOTP15 sees Pirela as the far superior prospect. Both his current rating and his ceiling are much higher than Refsnyder. Although Refsnyder has slightly more impact potential with the bat, Pirela can do more damage on the basepaths and with his glove defensively. Pirela can potentially fill in at all infield positions besides first base, while Refsnyder is limited to second base and some right field. 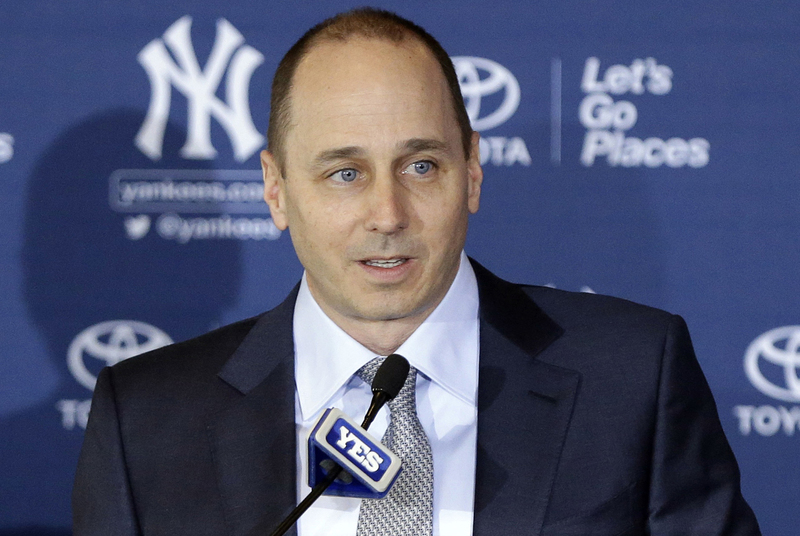 So if you are Brian Cashman, what do you do? Do you stick with Brendan Ryan as your everyday guy and give Pirela a shot to make a name for himself in a platoon situation? Do you trust enough in Refsnyder’s potential bat to give him a shot? Or do you go out and sign Drew back on? ‹ Player Spotlight: Who is Jung-Ho Kang?